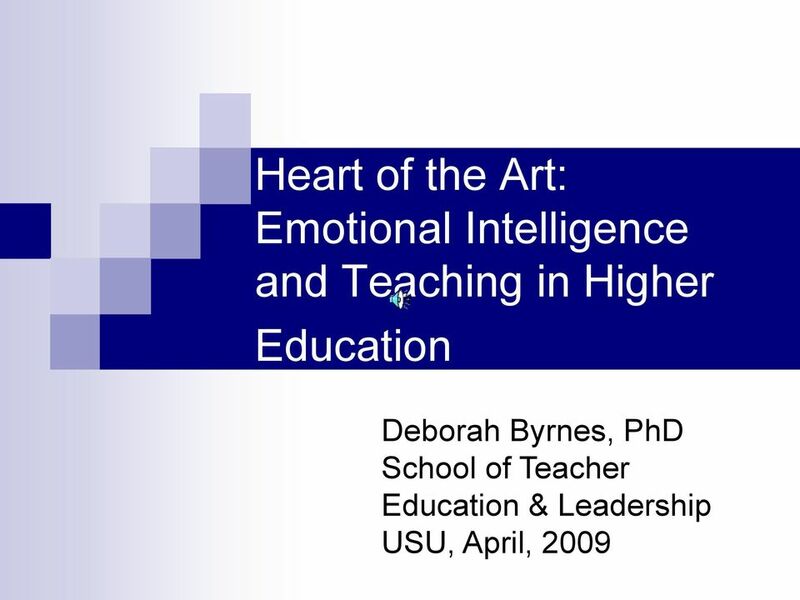 Download "Heart of the Art: Emotional Intelligence and Teaching in Higher Education"
3 EQ Definition Salovey and Mayer (1990) defined EQ as the ability to monitor one's own and others' feelings and emotions, to discriminate among them and to use this information to guide one's thinking and actions. 6 Is EQ more important than IQ to achieve success and happiness in your life? 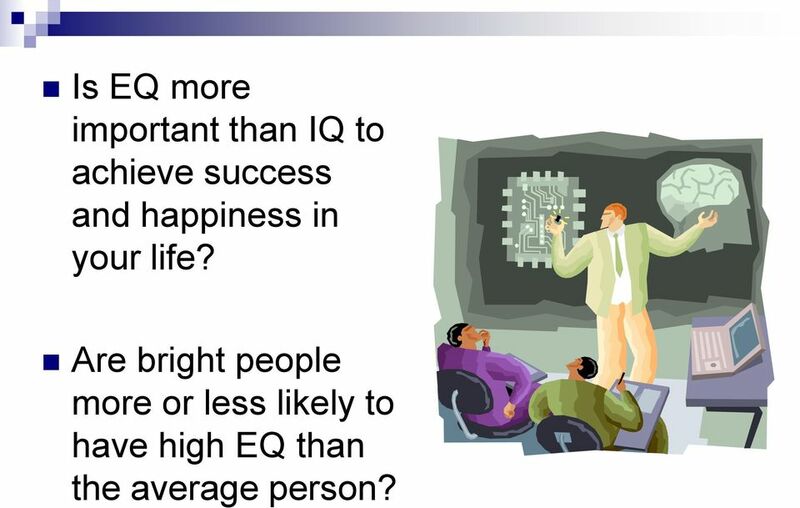 Are bright people more or less likely to have high EQ than the average person? 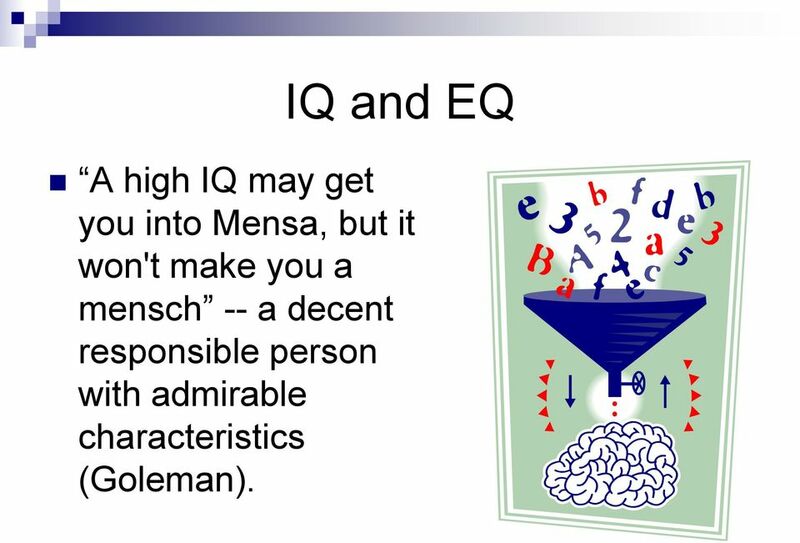 7 IQ and EQ A high IQ may get you into Mensa, but it won't make you a mensch -- a decent responsible person with admirable characteristics (Goleman). 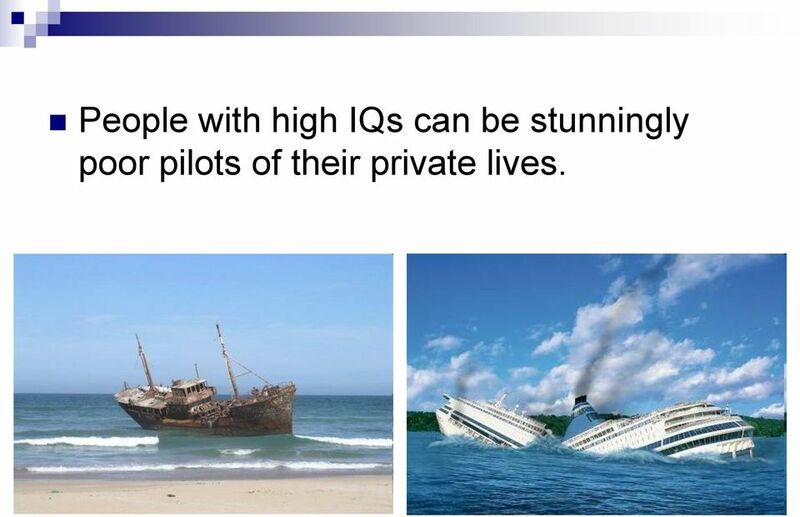 8 People with high IQs can be stunningly poor pilots of their private lives. 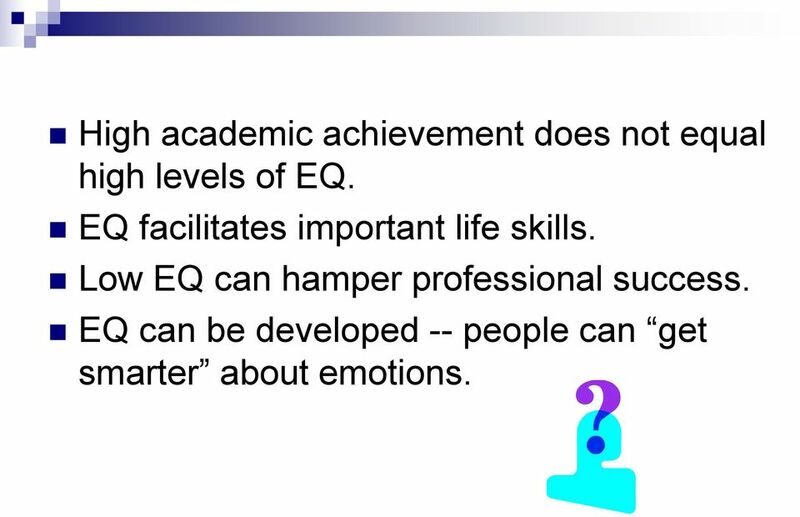 9 High academic achievement does not equal high levels of EQ. EQ facilitates important life skills. Low EQ can hamper professional success. 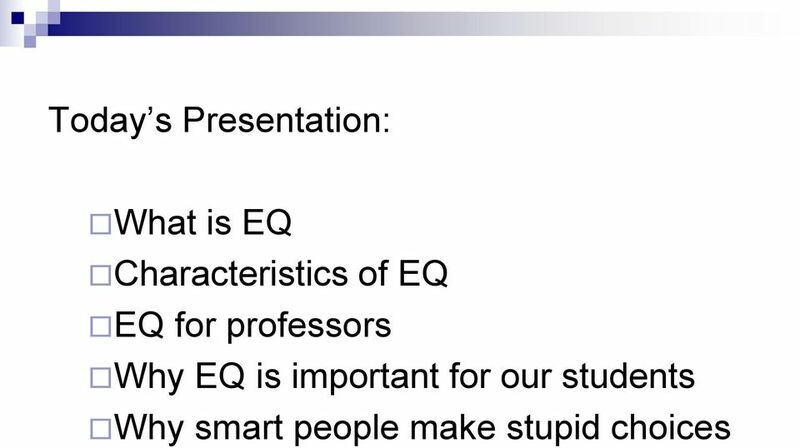 EQ can be developed -- people can get smarter about emotions. 10 Self Awareness The ability to recognize and identify one s feelings. 11 Benjamin Franklin There are three things extremely hard: steel, a diamond, and to know one's self. 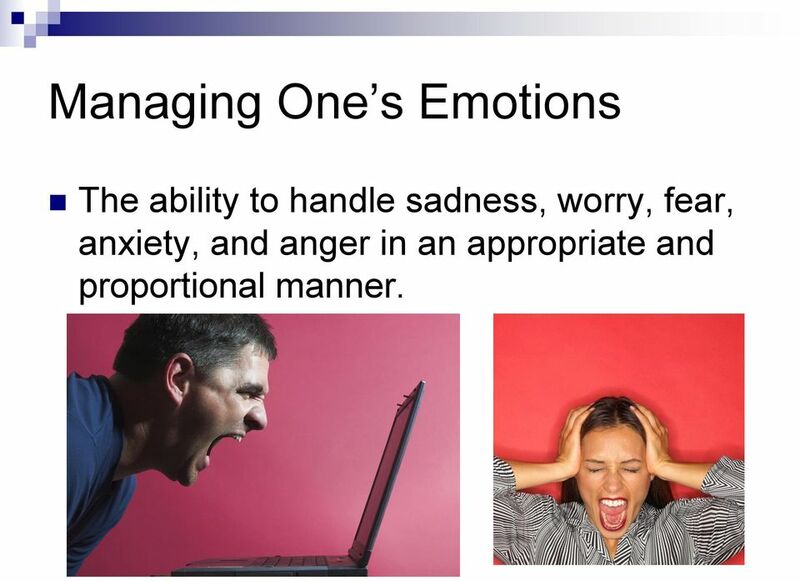 12 Managing One s Emotions The ability to handle sadness, worry, fear, anxiety, and anger in an appropriate and proportional manner. 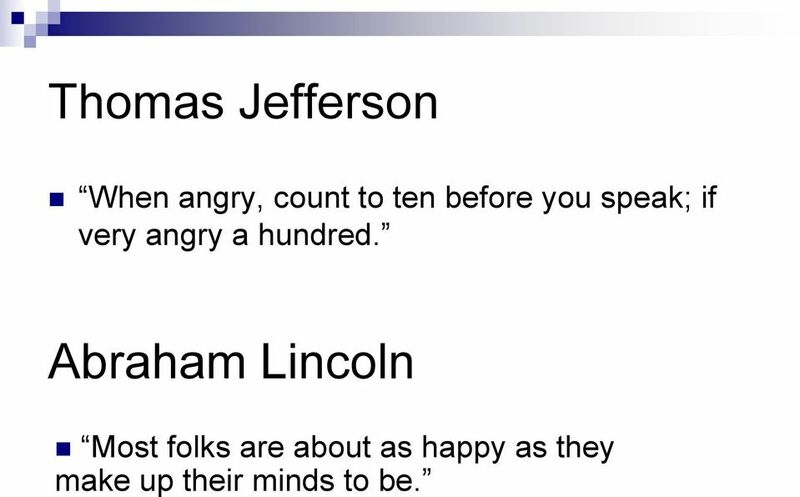 13 Thomas Jefferson When angry, count to ten before you speak; if very angry a hundred. Abraham Lincoln Most folks are about as happy as they make up their minds to be. 15 Wilma Rudolph I tell them that the most important aspect is to be yourself and have confidence in yourself. I remind them the triumph can't be had without the struggle. 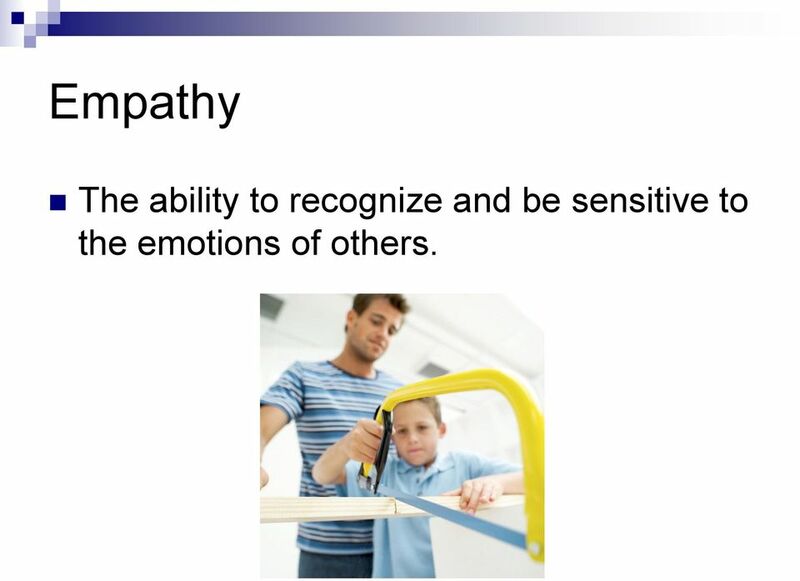 16 Empathy The ability to recognize and be sensitive to the emotions of others. 17 Mother Teresa There is more hunger for love and appreciation in this world than for bread. 18 Handling Relationships Getting along well with others. 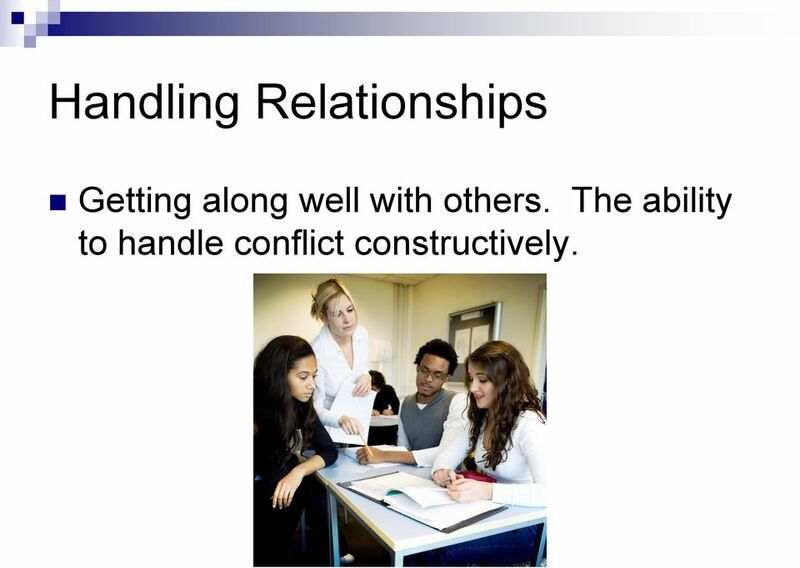 The ability to handle conflict constructively. 19 Maya Angelou I've learned that people will forget what you said, people will forget what you did, but people will never forget how you made them feel. 27 What feelings do your non-verbal and verbal communications convey to your students? Learners find my manner predominantly. 28 Empathy Do you know who your students are? Do you address anxieties or other emotional states that impact learning? Do you demonstrate empathy (for their situations and needs)? 30 Relationships Do you pay attention to and address the classroom climate? Do your students trust your intentions? Do you let your students know something about you? 33 What traits set superior performers apart from others? Results based on 108 interviews with employees of International Petroleum Corporation. 34 A study of 30 retired National Football League players shows the relationship of emotional intelligence to life success. 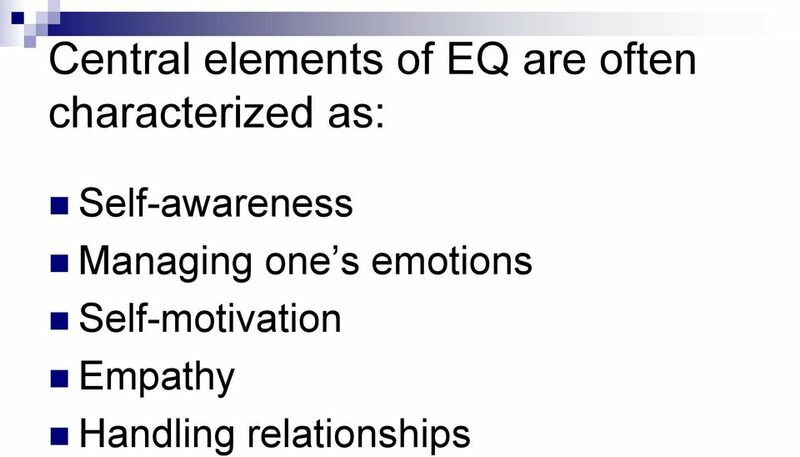 39 Helping Students Develop EQ: Work on your own EQ. Be explicit about the management of emotions. Develop self-motivation by engaging students curiosity and creating an appropriate level of challenge. 40 Emphasize cooperation to develop strong interpersonal skills. Talk about process as well as achievement. 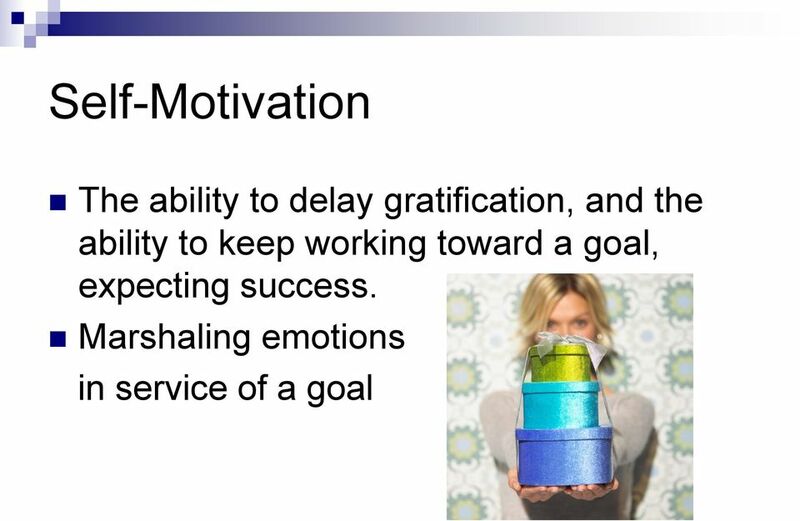 Include discussion of the role of emotional intelligence in being a productive, successful professional in your field. 42 References: Salovey & Sluyter (1997). Emotional Development and Emotional Intelligence: Educational Implications. Palmer, P. J. (1998). The Courage to Teach. Mortiboys, A. (2005). 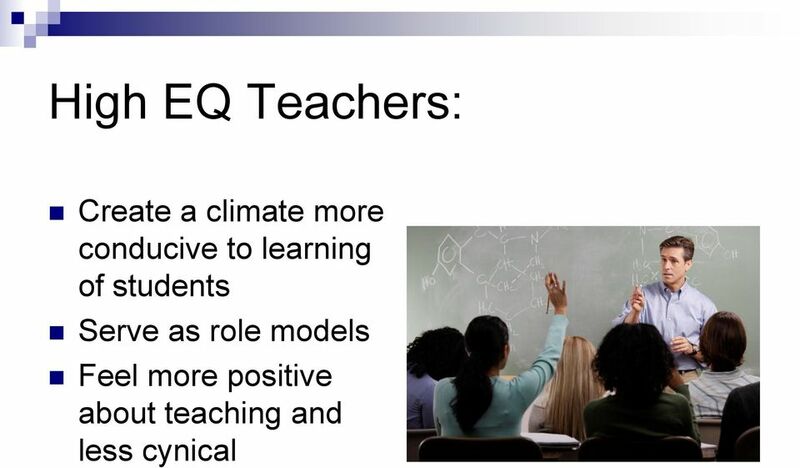 Teaching with Emotional Intelligence. Nathan, R. (2004) My Freshman Year. Bain, K. (2004). What the Best Teachers Do. Sternberg, R. (1985). Beyond IQ. Goleman, D. (1995). Emotional Intelligence. 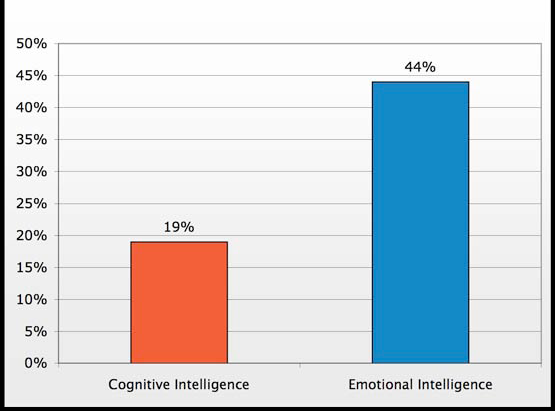 Emotional Intelligence Why does it matter? How do you incorporate Emotional Intelligence into your Medical Education Curriculum? Spiritual Intelligence and Why It Matters. by Cindy Wigglesworth President Deep Change, Inc. Spiritual Intelligence and Why It Matters by Cindy Wigglesworth President Deep Change, Inc. The Field of Intelligence In 1905 Alfred Binet and Theodore Simon developed the first modern intelligence test. 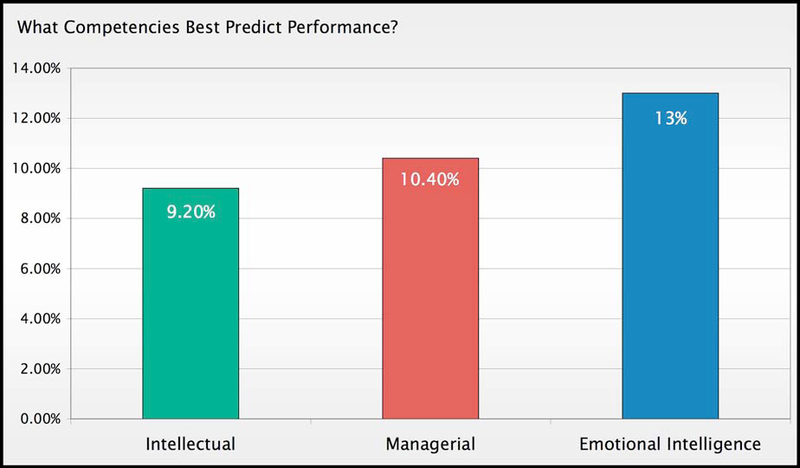 EMOTIONAL INTELLIGENCE ABILITY TO IDENTIFY AND MANAGE ONE S OWN AND OTHERS EMOTIONS. 2013 Hogan Assessment Systems Inc. The Interrelationships among Emotional Intelligence, Foreign Language Anxiety, and Willingness to Communicate. 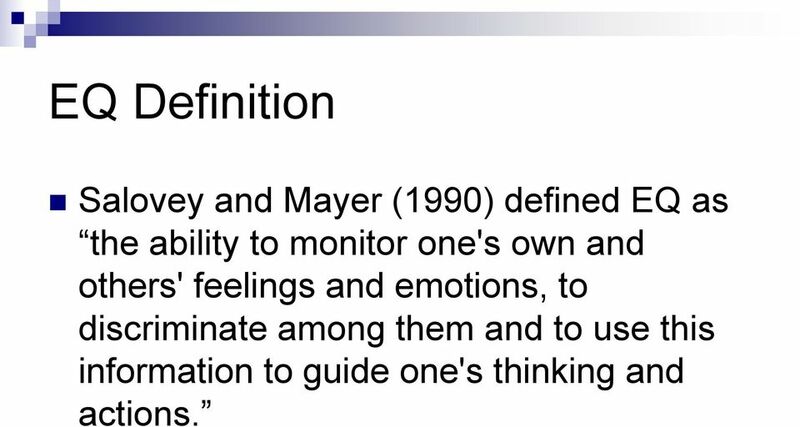 Emotional Intelligence and Business Ethics. The Necessary Factor for Transformational Leaders to Lead with Moral Principles. Communication Tactics for Effective Leadership. 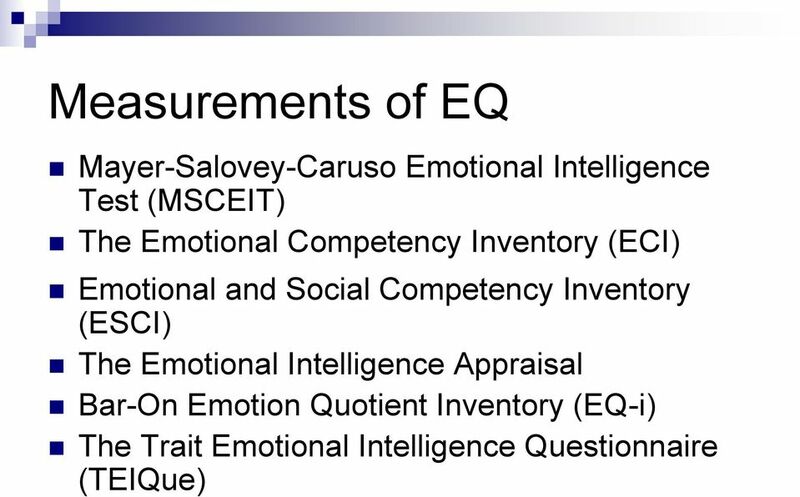 Michael J. Dunphy, Ph.D.
1 Emotional Intelligence in Superior Knowledge Work Timo Kultanen Information Society Research Center University of Tampere, Finland Abstract Last years have been a period of strong growth in Finnish economy. Sam Sample Sam@psytech.com RESPONDENT FEEDBACK REPORT 360 APPRAISAL. Psychometrics Ltd. Maintaining Relationship Wellness in Your life. Michelle Montero, Psy.D. The Power of Color: What Does Your Color Say About You? Emotional Intelligence at Work. Hendrie Weisinger, Ph.D.
Kouzes, J. M., & Posner, B. Z. (2007). The leadership challenge (4th ed.). San Francisco, CA: Jossey-Bass. St Petersburg College. Office of Professional Development. Business Skills. Finance and Accounting. Administrative Support.